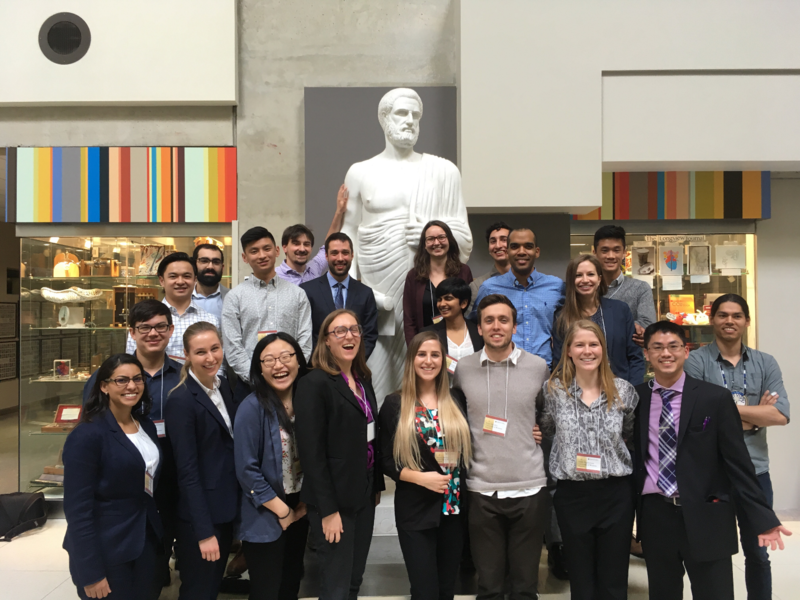 Schulich Medicine students have a passion of medical history, and this year 23 students had the opportunity to present their research projects at the annual History of Medicine Days in Calgary. It was a purple and proud few days, as Schulich Medicine boasted the largest medical student contingent of the conference for a third consecutive year. The national History of Medicine Days conference, held in Calgary promotes medicine history research and brings together medicine and humanities students from across country to present posters and oral presentations on their research in the history of medicine. Once again, Schulich Medicine students delivered strong presentations and receive awards in multiple categories. Shelley McKellar, PhD, Hannah Chair in the History of Medicine continues to be impressed by the work of the students. “The number and quality of history of medicine projects undertaken by our medical students is so impressive,” she said. “Schulich Medicine students have now forged a proud reputation of delivering well-researched, polished presentations. I have received much positive feedback from my colleagues beyond Western who have attended this meeting,” she added. In order to qualify for the Calgary conference, students are required to submit an abstract for consideration. In a competitive process each January, abstracts are submitted for presentation consideration. Seven students brought home awards. Robin Liu - 1st Place Best Presentation on Women in the History of Medicine and Public Health-"Between Scylla and Charybdis: The Birth of Maternal-Fetal Medicine and the Evolving Concept of Fetal Rights"
Michael Chen - 3rd Place Best Presentation on Women in the History of Medicine and Public Health - "A Panel Decision for Every Woman: History of Abortions and the Therapeutic Abortion Committee in London, Ontario, 1969-1988"
Madeline Arkle - 2nd Place Best Presentation on the History of Internal Medicine - "Picking up the Scent: An Exploration of Odor as a Marker of Disease"
Matthew He - 3rd PlaceBest Presentation on the History of Internal Medicine - "Taking on the State: How One Brave Doctor's Letter Curbed the 2003 SARS Epidemic in China"
Ariel Gershon- 3rd Place Best Audio-Visual Presentation - "How Amytal Changed Psychopharmacology: Off Label Uses of Sodium Amytal from 1920- 1940"
Matthew Roche - 2nd PlaceBest Presentation on the History of Surgery - "Murder, Mystery, and Medicine: An Examination of the Doctors behind Sherlock Holmes and their Influence on Pathology in Late 19th-Century Scotland"
Lakshmi Kamala - 2nd Place Best Poster Presentation - "History of Advanced Trauma Life Support: An Analysis of the Revolutionary Changes in Trauma Management Training"
Madelaine Arkle believes that participating in national History of Medicine Days conference has allowed her to embrace core values of Schulich School of Medicine & Dentistry. Markle who received second place for her work, feels inspired by the steady growth of the School’s contingent attending the conference. The History of Medicine program at Schulich Medicine & Dentistry is proud of the success and strong representation of its students at this meeting.